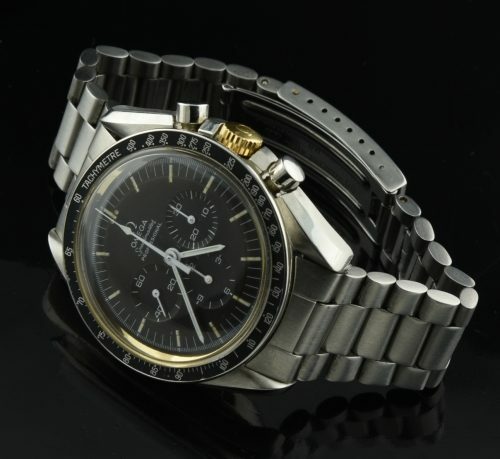 This is am EXTREMELY clean (pre-moon) Omega Speedmaster from 1969. The original dial has some very minor marks visible under a loupe only. The dial lume has aged to vanilla. The hands were likely replaced many years ago…(of course correct OMEGA). The ref. 1171 bracelet is VERY clean and without any major stretch. The caliber 861 manual winding movement is cleaned and working perfectly. At some time it appears the owner decided to install a gold crown and inner dial retention ring. They are both correct OMEGA and if you choose, you can easily install steel replacements which are readily available. If you like the two-tone look, this watch looks very cool. The original bezel is very clean. The case of this watch is without any major marks VERY CLEAN.